Editor’s Note: On November 12, 2018, our colleague Yael Friedman gave the following presentation at the International European Holocaust Research Infrastructure (EHRI) Seminar at Yad Vashem, Jerusalem, Israel. Her presentation was part of the Cataloguing and Accessibility afternoon panel. Twenty-one years ago, the Museum of Jewish Heritage – A Living Memorial to the Holocaust, New York’s Holocaust Museum, was dedicated by survivors. Survivors remain the core and driving force of our community. As a living memorial, one of our important mandates is to magnify their voices and preserve their testimonies. Since the Museum was conceived of and planned, survivors have been central to our mission to remember the victims and teach about Jewish life, before, during, and after the war. Visitors learn about this complex history through their voices, stories, and artifacts. We are an institution of public education and our visitors represent a wide range of backgrounds and religions, so this approach is critical. The full horror of genocide is in its ambition not only to murder individuals, families, and communities, but also to wipe out the entire people to whom they belonged—the people who could tell their story, acknowledge their humanity, and preserve their memory. In their attempt to obliterate the Jewish people, the Nazis sought to change the future and master the past. There would be no Jews to remember the Jewish people who were exterminated; there would be no Jewish perspective on Jewish history, no Jewish insistence that each life is important and should be mourned. Having been denied their humanity in life, victims of the Shoah would be denied it in death. There would be no survivors’ voices or rallying cries. When a survivor tells her story, she re-asserts the very humanity and dignity that the Nazis attempted to destroy. This is precisely why at the Museum of Jewish Heritage – A Living Memorial to the Holocaust, we teach this history through survivor stories and artifacts belonging to victims and survivors. We aim to allow visitors to hear from witnesses and make human connections mediated through technology and supported by artifacts. Many of our Gallery Educators – docents who lead tours at the Museum – are survivors, and even today, we still have several survivors who lead tours of our exhibitions. They are mediators, too. The more than 40,000 items in our collection illustrate Jewish life, reveal Jewish response to discrimination and persecution, and convey the trauma of extreme loss in the Shoah. These objects tell the stories of a world that flesh-and-blood people created, inhabited, and fought to preserve. We are all asking the same question: what happens when we can no longer hear in-person Holocaust survivor testimony? As survivors age, the Museum of Jewish Heritage is taking on an even greater role in Holocaust documentation and education, providing the resources that diverse audiences need in order to engage in active learning. As of 2017, the Museum’s Murray and Frida Krell Testimony Fund has supported our institution-wide initiative to (1) preserve and provide access to the full scope of the Museum’s collection of survivor testimonies; and (2) establish strategic partnerships to transform the Museum of Jewish Heritage into the only fully public site of testimony in New York—where members of the public will be able to access materials from other institutions that would otherwise be unavailable to them. Our next steps involve digitization of several thousand testimonies as well as expansion of particular programs, teaching guides, and online resources that enable visitors to meaningfully engage with the testimonies. This New York City institution will provide the most widespread public access to survivor testimony in the country, including testimonies from two external partners: 54,000 testimonies from the USC Shoah Foundation and 4,400 testimonies from Yale University Library’s Fortunoff Video Archive for Holocaust Testimonies. I would like to share with you some of our current efforts to expand access to survivor testimony and experiment with new technologies in order to do so. Of course, we offer as many opportunities as possible for survivors to speak to school groups and members of the public. In the past year, approximately 21,000 visitors heard survivor testimony from members of our Speakers Bureau. This year, we went a step further in envisioning how survivors might continue to teach us for generations to come, one high-tech way to ensure that future generations would still have the opportunity to speak to, and learn from, survivors. In our pilot installation of New Dimensions in Testimony, now called Dimensions in Testimony, created by the USC Shoah Foundation, recordings of Eva Schloss and Pinchas Gutter took up residence on large screens, ready to share their stories. We have heard questions echo through the halls of the Museum as people have come from around the world to speak to virtual Eva and virtual Pinchas. It is an incredible experience: you stand before one of these survivors, ask your question into a microphone, and receive an almost instantaneous answer. This is made possible by not only cutting-edge technology, but also the outstanding generosity of Eva and Pinchas themselves, each of whom spent days sitting under a dome of cameras, pre-recording answers to more than 1,500 questions. When the Museum envisioned how to present this experience, we imagined it as a way to explore the future of Holocaust education. We wound up getting a glimpse of the quality of remembrance that will be demanded of us in years to come—the ways in which we will all have to shoulder and transmit this history. In order to fully experience Eva and Pinchas, you have to take some responsibility for your own learning. You have to decide what you need to hear about and step up to the mic. You have to formulate—and ask—difficult questions. Sometimes you have to reflect and re-phrase. You may turn to the other people in the room—strangers, fellow students of history—and invite them to discuss what you’ve all just heard. This experience has prompted us to reconsider the ways in which we communicate—not just with virtual representations, but also with other people. To this end, the Museum of Jewish Heritage created the Heritage Testimonies® program to prepare for a future time when children and grandchildren of survivors will tell their relatives’ stories. Descendants of survivors share the survivor’s experience using excerpts of their relatives’ recorded testimony. After training with the Museum’s professional educators, participating second and third generation descendants of Holocaust survivors are currently helping school groups and other audiences connect with the history of the Holocaust on a personal level. This program is part of our efforts to define the future of testimony-based Holocaust education, pioneering new ways to explore survivor accounts and oral histories. This year, we expanded our use of testimony with the first major public engagement with the 4th generation. 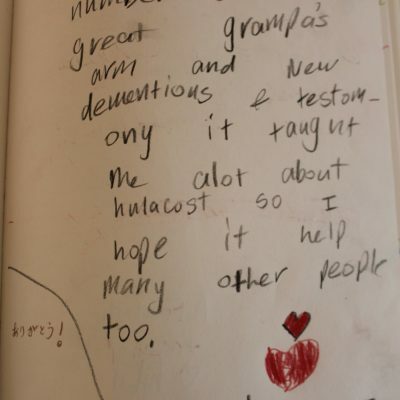 The Museum of Jewish Heritage co-presented the HBO documentary The Number on Great-Grandpa’s Arm, a short family film in which 10-year-old Elliott asks his 90-year-old great-grandfather, Jack, about the number tattooed on his arm. It sparks an intimate conversation about Jack’s life that spans happy memories of childhood in Poland, the loss of his family, surviving Auschwitz, and finding a new life in America. Their tender exchange is woven with historical footage and hand-painted animation to tell a heartbreaking story of Jewish life in Eastern Europe before and during the Holocaust. We have found that this short film teaches young audiences about the Holocaust through a survivor’s voice in an age-appropriate way. The OpEd I mentioned earlier, which focused on the importance of survivor testimony and the concerted efforts of eight North American Holocaust institutions to put testimony at the forefront of our educational and remembrance work, was shared via Facebook. Within just four days, the OpEd reached over 730,000 people on Facebook, with a staggering 97.5% full view percentage, which means that almost every person who viewed the article reached the bottom of the page. On average, 1 in every ~450 people in the United States saw this campaign. It is evident our mission resonates with our audiences. We recently integrated new technology in visitor engagement with testimony. Our newest special exhibition, In Confidence: Holocaust History Told By Those Who Lived It, which opened to the public in mid-September, is an installation in which visitors learn from survivors, telling their own stories across time and media. From secret diaries written in camps—recording events in almost real-time—to audiovisual testimonies, artworks, and interviews produced decades later, visitors have the opportunity to consider Holocaust history through the personal expressions of those who lived it. The exhibition culminates with a brand new “virtual reality” component – representing unprecedented advances in storytelling through technology – an experience called The Last Goodbye, an immersive virtual reality testimony produced by USC Shoah Foundation. Visitors are able to virtually walk alongside Holocaust survivor Pinchas Gutter as he tours the Majdanek Concentration Camp where his parents and were murdered during World War II. You may recognize Pinchas from earlier in this presentation; he was one of the Dimensions in Testimony survivors who has resided at MJH for over a year. This presentation of The Last Goodbye is its museum premiere, simultaneously debuted by the Museum of Jewish Heritage – A Living Memorial to the Holocaust, Los Angeles Museum of the Holocaust, Illinois Holocaust Museum and Education Center, and Florida Holocaust Museum. Through this partnership, visitors to Holocaust education institutions across the U.S. are discovering how “the technology of the future” can help us explore, study, and preserve evidence of the past. This new installation communicates historical content while allowing people to make human connections—advancing the Museum’s role as a living memorial. Now turning to the future plans for access to testimony, in order for the Museum to be the only fully public site of testimony in New York, we plan to digitize the testimonies we have in our collection. We are currently in the early stages of assessing our digitization needs for these testimonies. The Museum of Jewish Heritage holds approximately 4,000 audio and video testimonies by Holocaust survivors, liberators, rescuers, Jews who served in the Allied Armies during World War II, and many others. These testimonies include accounts of racial laws and discrimination, personal stories of families struggling to remain together, descriptions of the enormous challenges and devastation of the camps, memories of ways of life that were nearly stamped out by the Nazis, histories by American Jewish soldiers who liberated the camps, and so much more. These particular testimonies do not exist anywhere else. They are the products of original interviews and can currently be viewed only onsite by appointment, using old VCR equipment. In addition to its own collection, the Museum has full access to the 80,000 hours’ worth of testimonies gathered in order for Rainmaker Productions of New York to produce the 24 documentary films featured in the Museum’s core exhibition. However, the testimonies in the exhibition represent only a fraction of those that the Museum would like to make available. Much of the collection remains underused or unexplored. We are embarking on a joint project with other Holocaust museums in North America, excepting the United States Holocaust Memorial Museum, to digitize what are considered “hidden” testimonies; testimonies that are not accessible to the public. For the Museum of Jewish Heritage, this entails rescuing testimonies from old or obsolete technology such as VHS tapes; digitizing video and audio recordings so that they are re-formatted in current and long-lasting file types according to the highest standards in the field; creating metadata that will enable users to search with greater success; and maintaining the latest digital preservation standards so that files remain viable and accessible in the future. Although we are only at the beginning of this process, this is a high priority of the Museum. As the Museum continues to expand access, we will ensure that all of our testimonies are adequately represented online, giving virtual visitors anywhere in the world the opportunity to listen and learn from witness accounts. Online representation will also increase the likelihood that scholars, teachers, and students will discover resources and take advantage of the materials they can examine to study the Holocaust and the lives it changed forever. As part of the Museum’s efforts to enable and promote responsible analysis, it will develop teaching guides to help educators incorporate survivor testimonies into their lessons. It will also go one step further and actively foster scholarly inquiry. In fact, we have already begun this process through six kiosks set up in the Museum’s Keeping History Center in which the public and scholars can access all of the 54,000 USC Shoah Foundation Testimonies. We aim to make all of our digitized testimonies available in this format as well. I hope it has become evident that the Museum of Jewish Heritage has put survivor testimony at the forefront of our work – through education, exhibitions, collections, and public engagement. At MJH, we have found that survivor testimony is often what “gets through” to Museum visitors—communicating the lived experience of history and allowing people to make human connections. As we work to advance our educational programs, present new exhibitions and make our collection available to the public and scholars, the Museum takes inspiration and motivation from survivors—like Pinchas—who have explained what is at stake. We look forward to continue working with partners in the field on these pressing and important initiatives.